1. 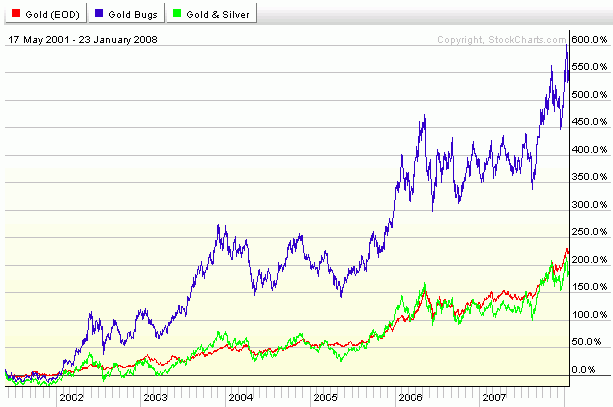 The Death of Gold Stocks? There are a number of private individuals’ calculations indicating that the cost of producing gold from declining ore grades does not increase in a linear fashion, but exponentially. Some of these papers contain mathematical calculations and assumptions that will make your head spin on several different axes simultaneously, so I am going to save you the discomfort. Fact remains that for one well known and well regarded gold producer (i.e., Goldcorp), ore grades at one of its Red Lake mine have dwindled from 77.5g per ton of ore in 2003 to 28g/ton in 2006. In other words, in 2006, the ore grade was only 36 % of that in 2003!. At the same time, production costs have soared 179%. Without a tremendously rising gold price during that time, these added production costs would have lead to a net operating loss and therefore a concomitant decrease in share prices. Production costs have another serious fire lit under them. Calls for a stop to open pit gold mining due to environmental concerns are getting louder and louder. In Australia, the production of one kilogram of gold requires 141 kilograms of cyanide and 170,000 gallons of water. All of that goes into the groundwater, of course. You can imagine how loud these screams will weventually get. Naturally, the expected continued increase in the price of gold will keep many gold miners afloat and operating in the black - but there will be years like 2006-07 during which the gold price consolidates while the cost of mining continues to increase, seriously hampering the miners’ profits. Let’s make a very simple assumption: Let’s assume the price of gold and the cost of producing an ounce of gold both increase exponentially at the same rate in every given time period. During any given period, then, the miners may remain profitable, but the profit will remain static while the price of gold will continue to rise and rise. Under such conditions, which would you rather own: mining stocks - or gold bullion? At some point in time, gold mining will become a most unprofitable undertaking for many companies, and they may have to cease operations altogether. Mutual funds that ow carry them will be forced to dump them, further seriously inpariring their share value. Since the illusion upon which our current debt-based worldwide monetary system is built will become more and more apparent with each year passing during the same time, the flight into gold’s safety will win out over any other financial safe haven, and the investment demand for gold will soar. And then, soar some more. Wouldn’t it be nice to have some gold at that time? Maybe just a little bit? Maybe a bit more? Does it make sense to keep “chasing the buck” by looking at the increase in the essentially illusory current fiat-price of gold, comparing it to the increase in the fiat-price of gold stocks, and concluding that, since gold stocks have historically risen faster on average than the price of bullion, stocks are a better “play”? If you didn’t get “in” before 2004, you missed out on the biggest differential. It’s possible, but I personally wouldn’t bet my entire fortune on it - or even half of it. If you held a gun to my head and forced me to pick between gold (or silver) stocks and the real deal, I will grab the real deal faster than you could pull the trigger. It’s no secret that I have been down on the dollar for many years, and the ephemeral electronic creature that bears this name has so far vindicated me. From a fundamental standpoint, there isn’t much that’s holding the old German “Thaler”s namesake up. Worldwide, only demand can support it. When demand ceases or declines past a certain point, there will be no return. Let’s leave the usual argument for gold aside and think exclusively in fiat banker terms. What do you suppose the US monetary authorities are planning? Thus far, the fiat reserve dollar has been the source of their power. Why are they letting it slide, now? I don’t believe for a second that they are planning to abdicate their power, ‘cause that’s what they live for. So, what else could they be planning? How can a crowd that has completely sold itself out to the pursuit of mere power over others benefit from letting the dollar fall below all apparent levels of support? Well, for one - they haven’t. Technically, the dollar has only broken below relatively weak support, even though that support line goes all the way back to the 1995 low, from which the dollar bounced twice before it finally sank into it current semi-oblivion. The dollar has broken below support point number one, but not yet through number two. The big question is: Will the dollar bounce again - or is it the absolutely last curtain call, this time? Of course, a chart has never controlled anything. Chart patterns are broken all the time. They can only give us some rough guidance, and they are always subject to violation by those pesky little things called fundamentals. Yet, this lower trend line has held at least six times already, and eight times if you count the instances where the dollar index came within reach of it before bouncing upward again). We talked about demand, already. Demand is currently still positive because most of the world’s oil is still sold in dollars - but that is changing very rapidly, now. If the world completely turns from the dollar, it will be because oil producers insist on getting paid in other currencies. 3. Why Are They Killing the Dollar? The US treasury is apparently doing nothing to discourage further forex losses for the dollar - beyond paying the usual lip service to a mythical and non-existent “strong dollar” policy. Is it because the Bushies are trying to let the US export itself out of its currently threatening slide into recession in 2008? Maybe, but that cannot be the whole story. As observed in the October Monitor (#40), there isn’t really enough productive capacity left in the US to fully take advantage of this opportunity. So, what is it? Are those people that claim the dollar is being ditched in favor of a western-hemispheric version of the euro, the so-called “amero” which is being called for by some in the Council on Foreign Relations (CFR)? For a long time I could not imagine how such a move could benefit the US elites. If there is no demand for the dollar with all of the still considerable economic power of the US behind it, how would adding a few “further mentioned” countries like Canada, Mexico, and Brazil to the currency regime make any difference? Their economies are far too weak to replace the demand lost in the rest of the world. Could the US (or whatever remains of it after the hemisphere is put into political lockstep) maintain its economic power without being the issuer of the world’s reserve currency? If an “amero” is really in the works, what would make it strong enough to do any better on the world stage than the dollar is currently doing? If the US has to exchange dollar for euros to buy oil, you can just imagine what that will do to the price of oil to US consumers who must pay in dollars. With oil-demand for dollars gone, we will have to pay somewhere upward of $20 for a gallon of gas. The US economy could not survive that, and with the most powerful economy gone, where would the US elites’ power be? Now, if the amero became a reality, how would that change this picture? The answer is that it wouldn’t - except for one simple fact that nobody writes about. At high enough prices, the recovery and refining of heavy crude into gasoline and other usable petroleum products becomes economically feasible. Do you have any idea how much heavy crude exists in “the Americas”? Enough to rival and surpass all remaining proven light crude reserves in the middle east combined. That’s how much. That’s the picture you and I have been raised on. It shows that almost all fo the oil in the world is in the middle east, and that’s why we have to “maintain our presence” over there, so we can always make sure we have enough of it. But now look at this graph. The lightly colored areas show the world’s supplies of heavy oil and oil sands. If and when the US elites succeed with their plans for the FTAA or “Free Trade Area of the Americas”, they will control all of that. The world’s greatest cohesive and easily accessible fields of heavy oil are in Venezuela’s Orinoco basin. Its potential exceeds that of the entire Middle East. The world’s second largest proven reserves of oil (including oil sands) are in Canada. Mexico has big reserves, too. The NAU or “North American Union” is only an early stage for the planned unification of the entire Western Hemisphere under the FTAA. By the time the FTAA becomes a political reality, however, you will have kissed the US Constitution and all of the freedom that still exists in the United States because of it goodbye already. You will have no rights other than those the hemispheric government grants you. Do you own gold and silver? Enjoy it while you can. When the western hemisphere is “united”, such frivolities will no longer be tolerated. Oh, yes, by the way: that hemisphere will also produce 34 percent of the world’s gold, at current production rates. Pretty hefty, for a single economic and political bloc. What can you do about that? Can you protect your assets from all this? You’d probably have to move to China or Europe if you want to continue to own gold and be able to enjoy the fruits of your labor - and wisdom. As mentioned in the 'Dollar-Crash Toolkit', since the Patriot Act there isn't much you can do legally to move your assets out of the reach of the USG without it knowing what you are doing. Any attempt at secreting money away from the US without leaving a paper trail will expose you to a charge of "trying to hide something." It will get the IRS and "FINCEN" onto your tail faster than you can count to three, and the mere fact that you indeed are trying to hide your money would give them ammunition to claim you were doing something illegal. It's better to stay here and fight it out politically. It's your only real chance, other than becoming an expat, and that will get you nowhere. Where will you go? To Europe, with its European Savings Directive? Not a good idea. I observed in an article published in early 2003 that Europe is going to continue to loosen its formerly tight bonds of friendship with and strategic dependence on the US and cozy up with Russia and China, instead. That trend has continued. Europe made ties with Russia that made it utterly energy dependent on Putin, and it made trade deals with China that allowed it to become less dependent on trade with the US and more on China. China and Russia, in turn, have long had a very tight military cooperation treaty that allowed China to obtain modern weaponry from Russia in order to threaten Taiwan and build a stronger presence in the Pacific theater. Back then I predicted that Russia with its overpowering conventional arms presence will one day simply walk over Europe and take it all, possibly without a shot being fired between the US and Russia - because the US will have lost its ability to project military force into Europe as a result of the vanishing dollar. Well, whaddaya know? Putin just announced that he will no longer abide by the Conventional Forces in Europe treaty that was signed by the parties, including the US, in 1990. Any ideas why he might want to do that? He is preparing for the day the US attacks Iran and gets even more bogged down in the middle east than it is now. At that time, he will pay Frankfurt and Paris a nice diplomatic visit - with about 40,000 tanks in tow. Armed with Russia's military cooperation treaty with China, and with China’s twitchy finger hot on its trillion dollar-reserves trigger, there probably will be no more than a whimper coming from the by then economically emaciated US. Naturally, Putin will not make this move anytime soon. He is just laying the groundwork for it. What he has achieved with his unilateral pullout from the CFE treaty was to “exempt [Russia] from the treaty’s quantitative force ceilings and ... quit the treaty’s system of mutual inspections and information exchanges on forces and movements,” according to an article in the Eurasia Daily Monitor from June this year. In other words: he wants to build his arsenal and position his forces. Only last night, CNN aired its “Amanpour” report about “Czar Putin” and discussed the ways in which Putin will continue to direct the affairs of Russia from behind the scenes even if he cannot be immediately be reelected to his current position at president. He will not go away. He lives for power. It becomes him. What Military does Europe Have? Naturally, most of the old Soviet Union’s 40,000 tanks are now quietly rusting away due to neglect and lack of spare parts, etc., but the predominance of Russia in terms of at least potential manpower and machine power is still significant. It seems that Sino-Russian relations are not what they once were, and not nearly as threatening today as they appeared back in 2002. Russia has been unable to fulfill many of the contracts for military weaponry and equipment the Chinese signed back then, and the Chinese are now looking much more toward the European Union hopefully lifting its sanctions against China imposed after the Tienanmen Square massacre back in 1989. Nevertheless, when it comes to voting in the UN security council and on other world forums, Russia and China usually vote in sync. Their strategic interests are closely aligned, for the most part, and especially when it come sto the US. Gone are the days where the US could bank on the near deadly rivalry between the two communist superpowers back in the seventies and eighties. Today, those former enemies are buddies with a healthy rivalry. As the world continues to beat a path to China’s door in both economic and political matters, the huge fraud that China really is simply staggers the mind. The only true viability this country really has is that its politically repressive government was able to pull out all the stops in order to get its tremendous population to work for it voluntarily instead of under duress. Allowing its subjects to “own” property and to share in the wealth that was previously reserved only for western European Nations, the US, Canada, and maybe Australia, was China’s greatest achievement as a country. However, it is becoming increasingly clear that is has very little capacity to actually create a self-sustaining economy with a political and economic system that is able to deal with some of the more common problems of high-tech countries. I wrote back in 2004 in China’s Dirty Trick that the economic miracle is a fraud and nothing more than a temporary mirage. The Chinese have simply taken a page out of the Western fiat system’s monetary play book and began printing and loaning debt-money into existence with a degree of abandon the world had theretofore never known. The predictable result was rampant inflation that isn’t even accurately measured and observed. China’s problem is that it ripped only about half of that page out of the Western play book, namely, the part that says “print money until the presses melt down.” The other part that says “you ave to regulate the banks and their lending practices and establish stringent safeguards to at least delay the certain crash” was left unread. Banks in the Chinese ‘hinterland’ are firmly in the grip of the nepotists. Bankers popped up out of nowhere to take advantage of the economic mushroom cloud that is slowly forming over the horizon. When their relatives and buddies were about to run their businesses into the ground because they blew all of the money they originally borrowed, the loss was just papered over with more money loaned. That’s how a street side vendor in Shanghai was able to sell cigarette lighters to the public at less than the cost of production. The producer just kept producing because he was able to borrow all the money he needed to keep his conveyor belts running - regardless of whether he actually turned a profit. Reports have been rampant of the sorry workmanship of the buildings comprising Bejing’s Olympic Village. Their only concern is that the building hold up while the foreign visitors are there. One of the people involved in building them warned that they will be unusable ruins soon after the Olympics are over. The Chinese government is hell-bent on spending its last nickel on making sure the world is duly impressed when it comes to watch the games. There is no quality control. Likewise, the dangerous nature of imported Chinese toys is proverbial here in the US. The reason: No quality control. China simply does not have the traditions of a civil (i.e., civilian-rule) society. Its history is one of military conquest, repression, and violence. Chinese have a four thousand year long national history that is virtually devoid of any experience with decentralized, civil rule. To be sure, the country also has a long history of great cultural achievements in philosophy, the arts, and science. Chinese literature has great epics of the triumph of the human spirit over corrupt, cruel and ruthless oppressors, but these stories all play out before a cultural and political background of abject oppression. Vocal opponents of unjust rulers, whether local or regional or even national, routinely had their entire families murdered, from grandparents to grandchildren, uncles, nieces, and nephews. Centuries of deforestation, along with the overgrazing of grass-lands and over-cultivation of crop-land, have left much of the north and northwest seriously degraded. Some reports say a quarter of the country is now desert. Then there is the problem of access to clean water. Although China holds the fourth largest freshwater resources in the world, two-thirds of its approximately 660 cities have less water than they need and 110 suffer severe shortages. More than 75% of the river water flowing through urban areas is unsuitable for drinking or fishing, and the Chinese government deems about 30% of the river water throughout the country to be unfit for use in agriculture or industry. As a result, nearly 700m people drink water contaminated with animal and human waste. In early 2007, Chinese officials announced that over a third of the fish species native to the Yellow River had become extinct due to damming or pollution. And more than 80% of the East China Sea, one of the world’s largest fisheries, is now rated unsuitable for fishing. When river water is not only unfit for human consumption, but even for agriculture and industrial use, you’ve got a problem. The reason for this is that, with the central government’s formerly iron grip suddenly relaxed and economic expansion tacitly encouraged at all costs, the formerly repressed turn into oppressors and exploiters in their own local areas. Without a legal system deeply grounded in respect for private property rights, polluting neighbors have carte blanche to pollute as much as they want, just as long as they produce something that can be sold for money somewhere else. Former communist local aparatchiks just don’t make very effective entrepreneurs. Robber barons, maybe - but not true business men. Ruling by force is different from leading by example. In the end, China is no real threat to the US. To its neighbors, maybe, but not to the US. Regimes like that always find themselves compelled to direct the attention of an unhappy population into aggression against their neighbors. Once the communists have degraded their own countryside to such a degree that life is no longer sustainable there, they need to “expand”. Watch it. It will happen. On that count, Russia herself isn’t that much better off. It has the same oppressive history of centralized control as China. Environmental pollution clamps a stranglehold on the big cities in Russia. Pollution in Russia now threatens the health of millions of citizens and the safety of crops, water and air. In 84 of Russia's largest cities the air pollution is ten times the accepted safety levels. In some areas, especially among children, levels of respiratory problems are 50 per cent higher than the national average. Moreover, Russia is a major contributor to global ozone depletion, being the World's largest producers and consumers of Ozone Depleting Substances (ODS). Thus, Russia’s emphasis on production at all costs has cost this country its environmental integrity. These countries are not really a serious threat to the United States. The reason for that is not because they have bad environmental records, but because their economic infrastructure is not even near what the world believes it is. But Russia is indeed a threat to Europe, as China is a threat to Asia. Bad conditions at home combined with newfound economic strength, even though built on a poor economic base, often tempt big powers to engage in conquest of their militarily weaker neighbors. This currently appears to be on Mr. Putin’s mind, although definitely not in the near term. Yet, these are two countries are some of the biggest buyers of gold for purposes other than official reserve holdings. China has just replaced Japan as the world's third largest gold consuming country, with an estimated 350 tons per year now ranking third behind India and the US. That figure is put into proper perspective when you consider that it was only at 240 tons per year in 2006, where it had been since 2004 at least. Eighty percent of China's consumption was reported to be for jewelry and 20 percent for investment, which is about in line with the global average gold yuse figures. India's consumption is growing prodigiously. Back in 2004, it was at 687 tons for the year. In September, the Business Standard reported that India will surpass the 1000 ton mark this year. So much for the financial news distorters who claim that Indian demand is dropping because of the current "high prices." You have heard over and over again that India’s demand is merely jewelry demand, and in a literal sense, that is of course true. But the reason why Indians buy as much gold as they do is decidedly not because they like jewelry so much. The buy their gold because it is a great hedge against bad times, and because in jewelry form they can also wear it! The same thing is probably true for China as well as most other Asian countries. Russia currently is the world's sixth largest producer of gold but has gold reserves second only to South Africa. It's central bank is committed to buying its own gold, not foreign gold, and will not sell gold into foreign or international markets, Konstantin Korishchenko, deputy chairman of the central bank said in September. With those kinds of domestic in-the-ground reserves and that kind of attitude, Russia will have little to worry about in foreign currency markets. 10. What Will Ron Paul Do? You may consider the following premature, but if Ron Paul actually manages to secure the GOP nomination and gets elected US president next year, what will he do if Russia attacks Europe? He is currently being branded as an "isolationist" and a crazy pacifist of sorts. His opponents claim he will plunge the world into chaos by refusing to project US power abroad. Will he fight to protect Europe from Russia, then? He has already been asked the question whether he will go to war if necessary. He answered that if Congress tells him to go to war with a proper constitutional declaration, he will. Yes, things can be that simple when you don't need to equivocate all the time. However, if Ron Paul really wins, gold and silver will be legal currency again, and that will mean the dollar's demise will not hurt the US to the same degree it will if Americans have no alternative to the dollar. And that means neither Putin nor any other Russian semi-dictator will ever dare to attack Europe militarily. See you all next month, in 2008 - and pray that it will be Ron Paul's year!